Every odd year cycle (2001, 2003, 2005, etc.) the Fraser River and many of its tributaries are literally filled to capacity by the returning adult Pink Salmon or Oncorhynchus Gorbuscha on their journey to their home rivers or streams to continue their bi-annual spawning ritual. Pink Salmon are the most plentiful of all the Salmon species. This year, 2003, the Fraser River Pink Salmon run is estimated by the department of fisheries and oceans conservatively at a whopping 20 million fish! Pink Salmon are a very important part of the Fraser rivers eco system. Pink Salmon take virtually no resources from their home spawning streams and yet they give generously to its well being to all of the other life forms that live off the river environment. When the Pinks return they do not compete for food with other fish as they have completely stopped feeding prior to entering fresh water. As the pink salmon spawns billions of eggs are released and a good many end up as food for a variety of fish, birds and animals. After the Pinks have completed spawning they all die, and therefore, donate their bodies to the river and its inhabitants. The dead fish carcasses serve two functions to the environment. First they provide food. Fish, birds and animals will all feast on the readily available protein. Second, the decaying bodies provide valuable nutrients that fertilize the river and provide food for all the micro-organisms that are the bottom of the food chain, but without them, nothing would exist. In the springtime after all the Salmon are long gone, the baby Pinks emerge from the gravel as fry and in very short order they exit the river to grow up and live their life at sea. Even as fry, the baby pinks provide food for many different fish, birds and animals and because they don't stay in the river to grow up they do not compete with native species or other juvenile salmon for the available food resources. Pink salmon have a very short life. They only live for two years and they only return on odd year cycles in the Fraser River. The Fraser River Pink salmon has a couple of advantages that benefits us as anglers. First, their sheer numbers are absolutely amazing. When the pink run is at its peak it is very obvious, there are Pink salmon flopping around everywhere. Pinks make their presence known as they maneuver up the river. Pink Salmon can be found in just about every type of water imaginable. The long, fast runs that hold Sockeye will also hold Pinks but they usually tend to be closer in to the shoreline as they do prefer the slower water. Side channels and backwaters are all prime Pink spots as are areas where tributaries meet the Fraser like the Harrison, the Vedder and the Stave. 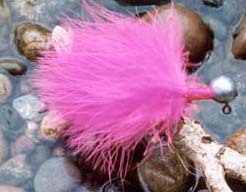 Most of traditional bar fishing spots and log booms in the tidal section of the Fraser are also good spots to fish for Pinks. The Fraser River, from Hope on down, is relatively easy for Pinks to swim through. The lower Fraser has many available locations to target these fish and because the distance is not far from the ocean, a one or two day swim at most so many of these fish are still in prime condition, they are silver sided with many still showing sea lice. Fraser river Pinks are also large, in most rivers systems Pink Salmon are only between 2 and 4 lbs but on the Fraser they average between 4 and 7 lbs, with a few over 10lbs! As with all Salmon, Pinks start to change physically once they enter fresh water. Pink Salmon start to enter the Fraser system in late August but the fish run well into October in some of the tributaries. Both males and females are very sleek, silvery and torpedo- shaped during their salt water stage of life, however once their spawning cycle starts to draw near their bodies go through very drastic changes. The females start to plump up as their cargo of eggs develops and matures, their noses become a little more pointy and their body colors darken and become more pronounced. The male Pink salmon go through one of the most drastic metamorphoses in nature. Male pink Salmon start out looking like a regular fish and end up looking like a sci-fi creature or an outer space fish alien! When the male pinks mature to their spawning form they develop a very large hump on their back, this is all flesh and is very large and pronounced when mature this is where the Pink Salmon gets its nick name "humpies" even though the male is the only one to develop this feature. Male pinks also develop a very distinct beak and their body colour darkens and also becomes much more pronounced. Pink salmon can also make great table fare, however you must be selective. If you try to cook up a "humped out" mature male you will be disappointed. Selective harvest of Pinks that are still silver and have not developed any of the telltale spawning features is the key to a good quality fish. In fresh water the females tend to be the best however if you keep a male that you could not tell the difference because it looked like it was still a salt-water fish, don't worry it will be just fine! Pink Salmon also require immediate attention right after they are dispatched. After you kill a Pink Salmon you must bleed the fish right away. This is done by either cutting the throat out or you can just rip out a gill with your finger. After the fish is completely bled out, clean it and put it on ice. If you do not do this quickly the fish will deteriorate fast and you will be disappointed. Pink Salmon have a mild tasting flesh and are great fresh on the barbeque. Pinks are also good hot smoked and are great canned but they do not freeze well for more than a few weeks. This season the Department of Fisheries and Oceans are looking at some new opportunities that were not previously available to anglers. Unfortunately at the time of this writing these details were not yet finalized. The Harrison River has a major run of pinks and will be open. The Fraser River will be full of them this season but because of the DFO's on going concern about possible mortality of Thompson River Coho that may be caught at the same time and opening on the Fraser is unclear. However, I have been told that they are working on it and hope to have a fishery for them this season. The Vedder and Stave rivers are also possible systems that may see openings this season for some pink action as well, so if all goes well we may be in for some great opportunity this season. Keep in mind that these are only proposals and may change by the time the fall Salmon season is upon us so check current regulations this fall to clarify what is actually open for Pinks. One of the very best features of a Pink Salmon is its willingness to take the hook. Pinks have to be the most aggressive of all Salmon in fresh water. These fish love to bite! Pink Salmon can be caught using a variety of techniques. Spin fishing, float fishing, bottom bouncing, jig fishing and of course fly-fishing are all very productive. Spin fishing is one of the simplest and most productive methods of angling for Pink Salmon. 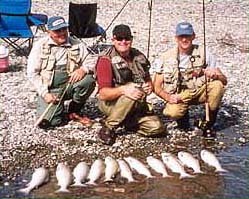 The best type of spot to spin fish is usually in river mouths, backwaters and areas where the water is moderate-slow to still. Pinks love to congregate in this type of spot. Literally hundreds can be milling around at one time. When making a cast you will want to retrieve your lure above the fish so once the lure hits the water, you can start reeling immediately. Pink Salmon also love to follow lures before biting so long casts and the slowest retrieve possible that still allows the lure to work properly are usually the most productive. 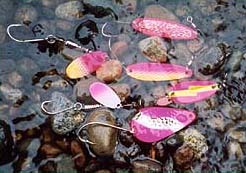 Lure selection is simple, Pinks love spoons. Small to medium sizes are best and a selection of styles is recommended. Colour choice is also basic, Pink is the best hands down. This can be combined with other colors and metallic finishes but the main theme must be pink and the brighter the better. Spinners also work well for pinks and sometimes have an advantage in still water as they can be retrieved slower and still provide good action, again small and medium sizes in the same pink color themes. Float fishing is one of the most popular techniques used for catching Salmon and Steelhead in the Fraser valley. Float fishing works best in medium fast to medium slow water speeds in depths from 3 to 8 feet. A whole book could be written on this topic alone but to simplify, this technique consists of a adjustable float, a weight usually a piece of pencil lead, a swivel and a leader that is about 24 to 30 inches long that leads to the hook. Often various shades of pink yarn is all that is used on the hook and this works well but size 12 to 8 spin and glow in a variety of pink colors are very productive when drifted just off the bottom in a flowing river. 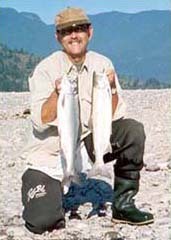 Bottom Bouncing is easily the most popular method of fishing for Salmon in the Fraser River. Round lead weights ranging from 1 to3 ounces attached to a swivel followed but a long leader ranging from 3 to 10 feet length that is then attached to a hook. 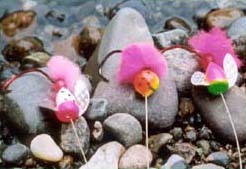 The hook is usually baited with pink yarn, a corky and yarn or a spin and glow all in the predominant pink colors. Bottom bouncing is best in medium to swift water ranging in depth from 2 to 7 ft in depth. Jig fishing is relatively new to many anglers as far as fishing for salmon is concerned but if you haven't given this a try you don't know what you are missing. Plain and simple Pink salmon love jigs! Jigs can be fished in two different techniques. Casting and retrieving is best done in very slow or still water that is at least 6 feet deep. Basically all you do is cast the jig out and jig it back. Do not let the jig bounce off the bottom keep the jig in the top 3 feet of water and jig the lure right to your rod tip, many times you will see the fish take the jig right at you feet and often there will be several fish following the jig back! The second way to fish the jig is under a float. Slow to medium speed water is best. Jigs do not fish well in faster water flows. Water depth should be at least 4 feet. Be careful when adjusting your float. You want the jig at least 1 foot off the bottom of the river. Jigs come in many sizes I prefer the ½ ounce this size can be cast well and also fished under a small sized steelhead style float. Once again various shades of pink are very productive. Fly fishing is a science all of its own but for anglers looking to catch there first salmon on the fly this is a perfect opportunity! Because Pink salmon can be found abundantly in slower moving waters and there size avengers about 5 pounds or so many anglers can take advantage of them on their lighter trout rods. In many places a 6 or 7 wt fly rod will work just fine. Fly lines should consist of intermediate sinking or intermediate sink tip lines. Leaders can be a straight 5 to 7 ft section of 10 or 12 lb monofilament. The fly selection should consist of flies sized from size 6 to about size 2. There are many patterns that will work, I prefer pink colored flies with weighted heads and flowing marabou bodies. These provide a real flowing action when retrieved with an aggressive strip flowed by a brief pause, Pink Salmon just love it! Fishing for Pink Salmon in most cases can hardly be classified as challenging regardless of an anglers preferred method; if the fish are present success is a forgone conclusion. But there is nothing wrong with catching a whole bunch of fish once and a while. This pink fishing is about having fun. Regardless of your angling experience or your preferred angling style you have to admit this is a blast! 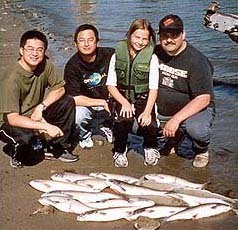 In prime Pink Salmon season it is common for anglers to catch in excess of 20 fish per day. There is just not a lot of fishing opportunities available like this to anglers so why not take advantage it this season. One thing is for sure the Pink salmon will be there, will you?